1. Longwood Gardens, Kennett Square, PA. As the longtime home of industrialist Pierre S. du Pont (of DuPont Company fame), this public garden, west of Philadelphia, reflects the taste of its founder. Longwood Gardens has more than 1,000 acres of outdoor gardens as well as the centuries-old trees which inspired du Pont to conserve the land. 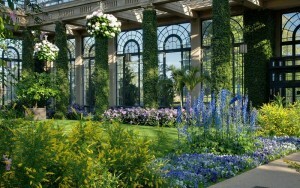 A historic, four-acre conservatory also sustains many of his favorite flowers, ferns, and fruits. Longwood also hosts a summer concert series, which is not to be missed! 2. Portland Japanese Garden, Portland, OR. Borrowing from Buddhist, Shinto, and Taoist philosophies, the late landscape architect Takuma Tono created a garden true to the traditions of his native Japan. Stone, water, and plants harmonize in the five distinct gardens of this 5.5-acre oasis near the Rose Gardens in Washington Park. 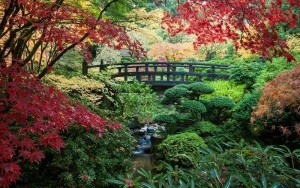 Bridges, pagodas, and an authentic teahouse punctuate the landscape of native plants and Japanese imports. 3. 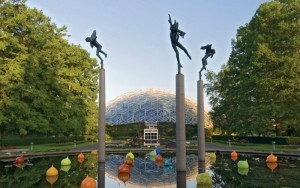 Missouri Botanical Garden, St. Louis, MO. You’ll find one of the country’s largest orchid collections at the Missouri Botanical Garden, which welcomed its first specimens of the delicate flowering plants in 1876. The garden now nurtures more than 3,000 orchid species, ranging from bright pink showstoppers to dainty, spotted varieties. Other notable displays include more than 700 types of daffodils, a dazzling selection of daylilies, and a tropical paradise inside the iconic Climatron conservatory, a 175-foot-wide, climate-controlled geodesic dome built in 1960. 4. The Bloedel Reserve, Bainbridge Island, WA. 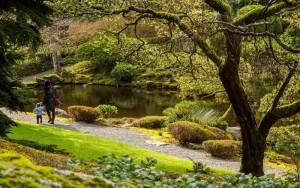 Established in the 1950s by a timber magnate and his wife, this island sanctuary (35 minutes by ferry from Seattle) captures the moody beauty of the Pacific Northwest. The self-guided network of trails passes from the lush, carpeted floor of the Moss Garden to the heights of a Douglas fir, western red cedar, and hemlock forest. Keep an eye out for trumpeter swans, great blue herons and kingfishers, a flower-strewn glen and an overlook across Puget Sound to the Cascades beyond. 5. Biltmore, Asheville, NC. 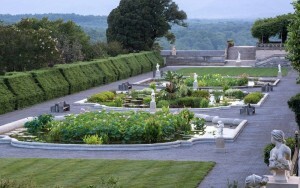 Landscape architect Frederick Law Olmstead, the mastermind of New York’s Central Park, designed the gardens and grounds cradling this 250-room Vanderbilt estate. His vision perseveres in Biltmore’s miles of forested paths, its 15-acre array of native azaleas—among the largest of its kind in the nation—and its formal gardens like the geometric flower beds of the Walled Garden and the Italian Garden’s water lily-filled reflecting pools. 6. 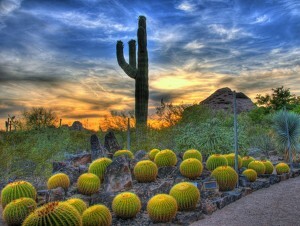 Desert Botanical Garden, Phoenix, AZ. Abandon any notion of a lifeless desert landscape amid the sandstone buttes of this 140-acre refuge. (Only 55 acres are cultivated). Here, among paved paths, plants suited to the arid climate of the Sonoran and other deserts thrive, including a large sampling of agave, cacti, and other succulents. A two-acre wildflower exhibit erupts each spring into a bounty of color—especially if there’s been a bit of rain—and butterflies take flight in a covered pavilion. If you want, there are classes available too, ranging from illustration for adults to planting for kids. 7. Chicago Botanic Garden, Chicago, IL. Nearly 200 miniaturized evergreens, maples, magnolias, and other trees—including priceless specimens cultivated by bonsai master Susumu Nakamura—add up to one of the best public displays of this ancient Japanese horticultural art. 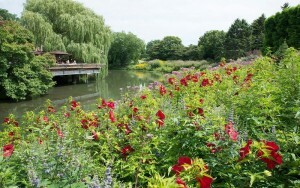 The garden’s 385 acres, which span nine islands and six miles of lakeshore, also encompass a local-centric fruit and vegetable garden, a 100-acre native oak woodland, and a classic English walled garden. 8. Fairchild Tropical Botanic Garden, Coral Gables, FL. 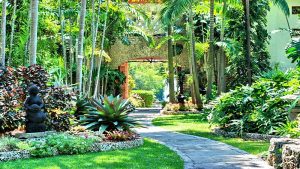 This oasis, less than 10 miles from downtown Miami, showcases more than 3,400 tropical species, many of them gathered by founder David Fairchild in his worldwide pursuit of useful plants from mangoes to bamboo. Employing the design expertise of influential landscape architect William Lyman Phillips, Fairchild opened the 83-acre garden in 1938. It now has one of the world’s premier collections of palms and cycads, plus an extensive tropical fruit program supporting mangosteen, durian, and other far-flung flavors. 9. 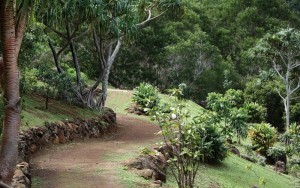 Limahuli Garden and Preserve, Kauai, HI. If you are lucky enough to live in or to be visiting our 50th state, this tropical expanse contains nearly 1,000 acres of pristine forest and riparian habitat. Visitors tour the gardens at the base of the 2,000-foot-deep valley—named “The Best Natural Botanical Garden” by the American Horticultural Society—to see rare native ferns, herbs, and palms. Culturally significant plants include: taro, frangipani, and papaya. 10. 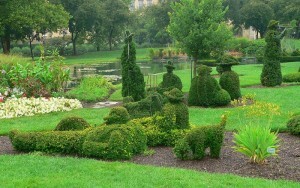 The Topiary Park, Columbus, OH. Molded from yew shrubs, dozens of topiaries reaching 12 feet tall transform this seven-acre downtown park into a living sculpture garden. It was the brainchild of local artist James T. Mason, who debuted the display in 1992. The centerpiece is an interpretation of French Post-Impressionist painter Georges Seurat’s 1884 work, A Sunday on La Grand Jatte, a collection of men, women, children, and animals and is believed to be the only topiary version of a painting. If you’ve never experienced the beauty of a public garden, now’s the time to visit. No matter what the season, there’s so much to see and do!